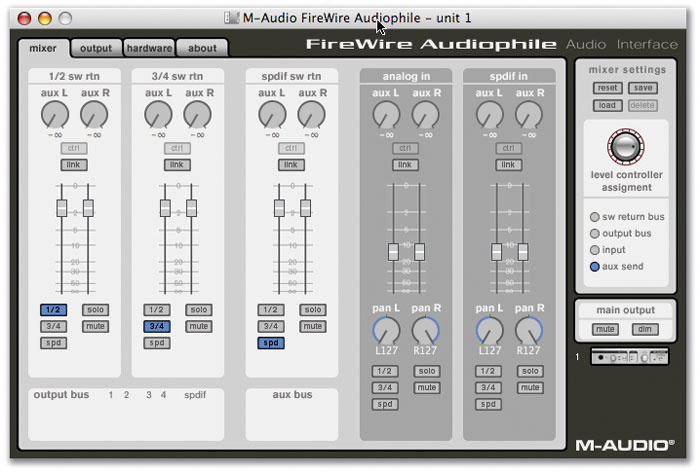 Until recently, the benefits of the high-bandwidth IEEE 1394 interface were available only to musicians on a relatively generous budget, but now M‑Audio are making Firewire peripherals available at new low prices. 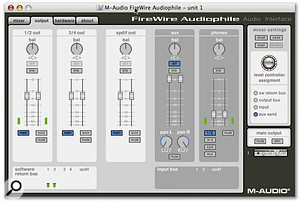 Firewire audio interfaces have, until recently, been specified and priced for the pro and semi-pro market, with names such as MOTU and Metric Halo at the forefront. M‑Audio, with their Firewire 410 (reviewed SOS March 2004), have expanded the market downward and continue this trend with the introduction of the Firewire Audiophile, taking what is now a family name from their ever-popular PCI interface and its USB sibling. With an SRP of £229 including VAT, and already just under £200 'on the street', this interface breaks a psychological price barrier and competes with some of the higher-end USB interfaces such as the Tascam US122 and Emagic EMI 6|2 (and 2|6). Where it scores, of course, is in using the high-bandwidth Firewire protocol, which has been proved capable of supporting far more channels than this interface offers. The sense of 'will it work or won't it?' engendered by the restrictions of USB, a connection originally intended for printers and scanners, and the resultant negative attitude towards it as a serious protocol for audio are not stigmas from which the Firewire Audiophile will suffer. In the box along with the Audiophile, M‑Audio supply two Firewire cables, one six-pin to six-pin and one four-pin to six-pin. Along with the power-supply unit and a CD containing drivers and manuals, they also include a software bundle comprising Ableton Live Delta, Arkaos VJ Lite, Propellerhead Reason Adapted, Dsound RT Player Express, IK Sampletank Free and Linplug's Free Alpha soft synth. The unit itself has an elegant case intended for the desktop, measuring 184 x 140 x 42mm. It follows the design cues of the larger 410 and the USB Audiophile (albeit with more muted colours) with brushed-aluminium finish and silver-coloured control knobs. The front panel has a reassuring simplicity, with only two buttons and two rotary controls along with a headphone jack and a sprinkling of subtle LEDs. The Firewire Audiophile's driver software under Mac OS X. The unit's Assignable Level Controller can be switched to control four different signal levels (right).Round the back there are two unbalanced analogue inputs using RCA sockets at -10dBV line level, four analogue unbalanced outputs with identical spec, co-axial RCA connectors for S/PDIF input and output, MIDI In and Out sockets, a power-supply connector and two six-pin Firewire 1394 sockets — the second is useful for connecting further Firewire devices if your host computer has only one port. The S/PDIF output should support pass-through of AC3 and DTS-encoded multi-channel digital audio for connection to a suitable decoder, although at the time of writing there was an issue with DTS awaiting a driver revision. Software return — that is, the level of the three stereo pairs running from the host software to the virtual mixer. Output levels of the three stereo pairs of outputs (two analogue pairs and one digital pair). Input levels of the analogue input pair and digital input pair. Next to the headphone socket is a switch that selects the monitor source (in conjunction with the Headphones source settings in the hardware page of the control panel). There are LEDs to indicate headphone source monitor status, S/PDIF input and output (in the presence of a valid signal) and power, where steady status indicates a valid connection to the host computer. Checking M‑Audio's web site for the latest drivers, I downloaded build number 1016 for Windows XP (the supplied CD had version 1011) and 1068 for Mac OS X (1064 on the CD). I'm undecided about this constant driver revision — of course it is reassuring to see that M‑Audio are committed to revising drivers that iron out bugs and conflicts, but one can't help worrying that early adopters might feel they are being used as unpaid beta testers. Driver installation was completely painless on both XP and OS X, having taken heed of the warning not to have the Audiophile connected during the process. Along with the driver, a control panel is installed, accessible from an icon in the system tray on Windows, and in the Other subsection of System Preferences on the Mac. You could drag this to the dock to create a graphic shortcut similar to XP's System Tray icon. Amongst other options, you can choose which output feeds the headphone socket.The control panel in both cases has the same four-pane design as that which comes with the 410, reflecting the commonality of functions, but displays fewer channels on each pane, in line with the reduced number of inputs and outputs. The Mixer pane shows level faders for the six software return channels, arranged in stereo pairs. These are accompanied by output select switches that, by default, route these channels to their corresponding physical outputs, and give you the opportunity to set up your own routing if you wish. The two pairs of faders controlling input levels have similar monitoring options that are unselected as a default. All the faders can be linked in stereo pairs and each pair carries two auxiliary buss send level controls, one for each side of this extra stereo buss, which allows for the creation of a separate submix if desired. All input channels have pan position controls. The Output pane has faders for the six physical outputs of the Audiophile, arranged in stereo pairs, and stereo channel faders for the auxiliary buss and headphone levels. The Hardware pane shows detected sample rate and allows for the setting of sync source, headphone source and the function of the front-panel momentary switch. This can be set to switch between the two possible headphone source settings (A or B), or to switch between Direct Monitoring Off or On. On this pane the XP version differs from OS X, in that samples per buffer (latency) is selected on this pane of the control panel. In OS X this is chosen in the driver configuration window of the host application. Common to all panes are the Save and Load switches for mixer settings and the buttons for choosing the function of the Assignable Level Controller. Just below this is a graphic indicator of the number of Audiophiles connected, showing which one is being actively affected by the Control Panel. It should be noted that under Mac OS X multiple Audiophiles were not supported at the time of writing, but imminent change was expected with a future driver revision. With the provision of unbalanced inputs and outputs only, the Audiophile is always going to be susceptible to the rogue hums and buzzes that plague such equipment when connected to other devices in the studio. This can be avoided to some extent by the use of pseudo-balanced cables (see Frequently Asked Questions in Sound On Sound January 2002, amongst other articles). As far as audio quality is concerned I found the unit to be on a par with that of the Tascam US122 I have been using recently for mobile recording and playback, although this latter device does benefit from the advantage of balanced inputs. Tests with Rightmark's Audio Analyser revealed a frequency response of +0.12, -0.87 dB for 20Hz to 20kHz at a sample rate of 44.1kHz. This improved to +0.04, -0.10 dB at 96kHz. Dynamic range improved from 95.6dBA for 16-bit operation to 101.3dBA for 24-bit operation, agreeing with M‑Audio's quoted figure for input 1/2 — the headline figure of 108dBA quoted on M‑Audio's web site is for the outputs only. Total harmonic distortion and noise for combined input and output was measured at 0.004 percent. 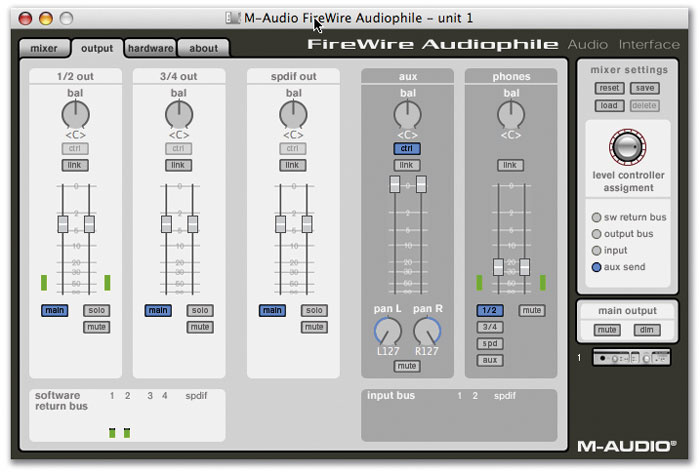 The Audiophile can be buss-powered, although on many laptops the Firewire buss is not able to supply enough power. These are recognisable by their four-pin socket (often called iLink), where a fully powered buss sports the larger six-pin variety. Confusingly, PCMCIA Firewire cards often carry six-pin sockets but despite this they also lack sufficient power. In both these cases it is necessary to connect the supplied mains adaptor. The test iBook seemed perfectly at ease powering both the Audiophile and a Lacie Pocket Drive daisy-chained from its single Firewire port (M‑Audio recommend the Audiophile to be last in the chain) although battery life was considerably foreshortened in this situation. It already tires too quickly for my liking, although as a side note, upgrading to OS X 10.3.3 just before this review went to press seemed to have quite a beneficial effect on battery life, a more thorough test of which will hopefully appear in a future article. On both platforms the audio drivers worked flawlessly down to the smallest buffer size of 64 samples, recording at the maximum resolution of 24-bit and 96kHz sample rate, giving an impressively (almost) negligible 1.5ms of latency. However, where everything worked like a charm in the XP environment, functionality in OS X on the iBook was hindered by a few annoying niggles. Initially, while audio worked without a problem, MIDI communication was notable by its absence; after several launches and quits, attempting to load Cubase or Logic with the Audiophile connected caused the computer to restart. Initially I suspected a MIDI driver conflict, having recently run into problems on another machine connected to a Digi 002 Rack and Midiman 8x8, where the simultaneous presence of both MIDI drivers in the folder System/Library/Audio/MIDI Drivers stopped the 002 from being available to hosts other than Pro Tools. Simply moving the 002 MIDI driver outside the Drivers folder had allowed Logic and Cubase to use the 002 as an audio interface (without MIDI, of course). An obscure forum posting concerning driver conflicts between Digidesign and Tascam had led me to the above 'solution', and the test machine for this review had Tascam drivers installed, so I tried removing both of the other MIDI drivers in the iBook's driver folder (Emagic's MIDI driver as installed by Logic, and the one for the Tascam US122) and retested. Like many USB interfaces, the Firewire Audiophile is equipped only with unbalanced audio I/O.Initially I thought I'd cracked it, as removing both these drivers and leaving only the Audiophile MIDI driver allowed the MIDI In and Out to work on the device. Just to make sure, I then put them back expecting the problem to return, which it didn't. So much for my hunch (as Jean de Florette once famously remarked). My suspicions then turned to Disk Permissions. When odd things happen that don't conform to a pattern it often indicates a problem 'under the hood' of OS X that can be cured by repairing Disk Permissions on the System disk in Disk Utility. Realising I hadn't repaired disk permissions for quite some time, I went to Disk Utility and pressed the magic button. Since when I have not had a problem with the Audiophile's MIDI I/O. However, the story did not end there. Whenever my iBook went to sleep a valid connection to the Audiophile was naturally lost, but it was not re-established on waking up. The only way of doing so was to restart the machine (turning the Audiophile on and off was not enough, nor was disconnecting and reconnecting the Firewire cable). I encountered the same difficulty on a dual G5, and checking M‑Audio's web site revealed that this is a known problem with OS X, and also suggests that the latest driver revision goes some way to curing it. What I did discover was that this is only a problem when an application (such as Logic or Cubase) is open. With no application open, connecting to the Audiophile is re-established on waking up. How often do you close an application before putting a computer to sleep? Still, it's good to know that M‑Audio are aware of the problem and, even as I write, are beavering away to provide a solution. Windows XP and 2000 users are unaffected by this anomaly. The market positioning of the Audiophile is intriguing. It offers four-in, six-out operation (albeit that two each of those are digital) and MIDI, along with highly competitive audio quality for the price, flexible software control and the bandwidth headroom and general cachet of Firewire, for the price of a higher-end USB interface. Firewire still has a premium attached to its name, and the extra overhead it affords allows this device to gain an appreciable advantage over its USB stablemate, in terms of simultaneous channels of operation and the ability to carry an independent submix. With unbalanced connections and no preamps or phantom power, its role as the hub of a laptop-based audio recording workstation has a few limitations. M‑Audio maintain that the Audiophile was created with live performers and DJs in mind, and this device would make an excellent choice for laptop users requiring multiple outputs and some MIDI control in a live situation, with the added flexibility of surround-encoded digital output. And this is just a suggestion, but how about a version that has two pairs of analogue inputs, one pair of analogue outputs and a mix fader (along with software emulation of the RIAA EQ curve) — that really would be a laptop DJ solution! Pentium III 500MHz or higher. Windows 2000 SP3 or Windows XP SP1. Six-pin Firewire port or adaptor. Mac OS 10.2.6 or greater. Currently has problems with sleep in OS X. The M-Audio Firewire Audiophile uses the power of Firewire to offer more inputs, outputs and routing options than similarly priced USB alternatives, though it's currently held back under OS X by driver issues. M Audio +44 (0)1442 416590.